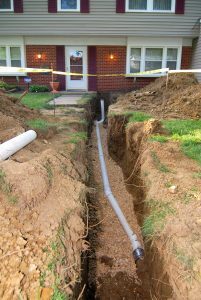 If you’re thinking about clearing a lot, digging a foundation, or – unfortunately –installing or repairing your septic system, then you need an excavation contractor. What’s an excavation contractor, you ask? Quite simply, it’s an individual in business to move large amounts of dirt. An excavation contractor does much more than just move dirt, of course. The responsibilities of an excavation contractor include such things as site preparation, including land clearing and grading; trenching for sewers, septic systems, water pipes, and cabling; and any other construction site job that requires industrial-size pieces of equipment to – yes – move large amounts of dirt. While all excavation contractors are contractors, not all contractors do excavation. In a typical residential construction project, an excavation contractor arrives on the scene after the surveying crew determines the house position and lot boundaries. The contractor removes the soil to the depth required for the new foundation and ensures that the soil is firm through compaction tests and the use of mechanical compaction, if needed. Excavating requirements are precise, so the excavation contractor must be skilled and experienced in the use a level and transit to match the grade posted by the surveying crew. After the foundation contractor pours the footings and stem wall, the excavation contractor backfills around the new foundation. For a construction project like this, the excavation contractor is actually considered a subcontractor because the digging and earth-moving part is just one component of the entire construction job. Excavation contractors often typically work for the general contractor who’s in charge of the overall construction project. If you’re in need of an excavation contractor anywhere in southern New Hampshire or Worcester County, east to Boston, give us a call here at J.T. Glynn Construction. We have the added benefit of not only being an excavation contractor, but a general contractor as well, experienced at delivering entire construction projects on time and on budget. Whatever your construction and excavation needs, J.T. Glynn can help.